With the help of the chassis overview page you find more than 5000 loudspeaker chassis. 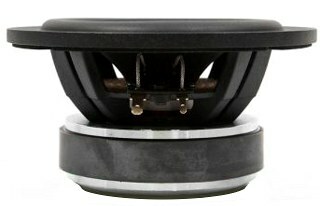 => more loudspeakers of this brand. with HP50 reflex tube, 18 cm long. The cabinet volume calculations are executed considering an external resistance of 0.3 Ohm. We are using, if no other data is known or available, the information supplied by the manufacturer. Please note: the frequency response doesn't say much about the cut-off frequency inside the cabinet! Therefore, we mostly give you 2 examples with dimensioning considerations and an indication, how low the loudspeaker will reproduce.